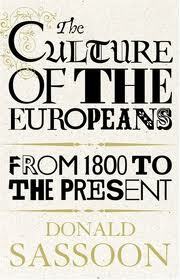 In the conclusion to his immense tome, The Culture of the Europeans, Donald Sassoon has one of those brief apercus that seems blatantly obvious when you think about. It’s just that we usually don’t think about it. In reality the home was always the centre of cultural consumption. Of all the cultural forms surveyed in this book, only the cinema succeeded, for a historically brief period, in getting a majority of people to consume culture outside the home. Sassoon’s scope is large, ranging from the 18th century to the present, and covering not just Europe and America, but European-influenced culture in Africa, Asia, Australasia; and he looks at the business of book publishing, newspapers, cinema, theatre, music (performance and recording), exhibitions, radio, television, and just about every other form of mass cultural production. I consume all of them, to some degree or other, but like everyone else I suspect, I do far more of it at home than elsewhere. There are many reasons for this: cost, convenience, opportunity. I would, for instance, love to go to more concerts, but the economics of the business mean that the overwhelming majority of the venues likely to stage those performances I wish to see are in London, and the reality of the situation means that whenever I go to a concert in London I have to leave before the end in order to catch my last train home. Watching a performance at home on the television or a DVD, or listening to on a CD or the iPod, has none of the cost of going to a concert, and none of the inconvenience of not being able to enjoy the entire show. And yet, culture is about sharing, about commonality, about appreciation and enjoyment of others. It feels like there is a contradiction in celebrating commonality by locking ourselves away in our own homes. But is there? Later this year, the Gulbenkian in Canterbury will be showing Buster Keaton’s The General. This is one of my all-time top-ten films, I have seen it many times, I have it on DVD, but I will be going to the cinema for this show because I have never previously had a chance to see it on the large screen. Will the presence of other people in the cinema affect my appreciation of the film? Undoubtedly, in a social way. But not necessarily in a cultural way, the consumption, the sharing, will be between me and what is on the screen, rather than between me and the rest of the audience. Culture seems to be something that operates between the cultural producer and the many, rather than among the many. At least, that is the impression you are left with after reading about the history of cultural production. Whether that is the only interpretation, I doubt very much. But this is a book that has engaged me for just over a year, it has given me an awful lot of fascinating information, it has given me a different perspective than usual on cultural history, yet in the end I think it has given me more questions than answers (which is a good thing).